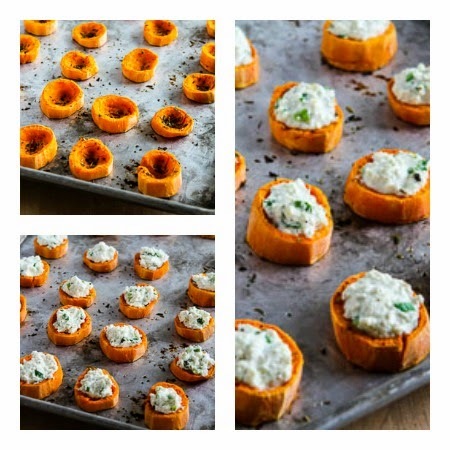 These Sweet Potato Appetizer Bites with Feta and Green Onion are a healthier nibble for holiday parties or the Superbowl! And these tasty appetizers are low-glycemic, South Beach Diet Phase Two, vegetarian and gluten-free. Use the Special Diets Index to find more recipes like this one. Click here to PIN these tasty Sweet Potato Appetizer Bites! 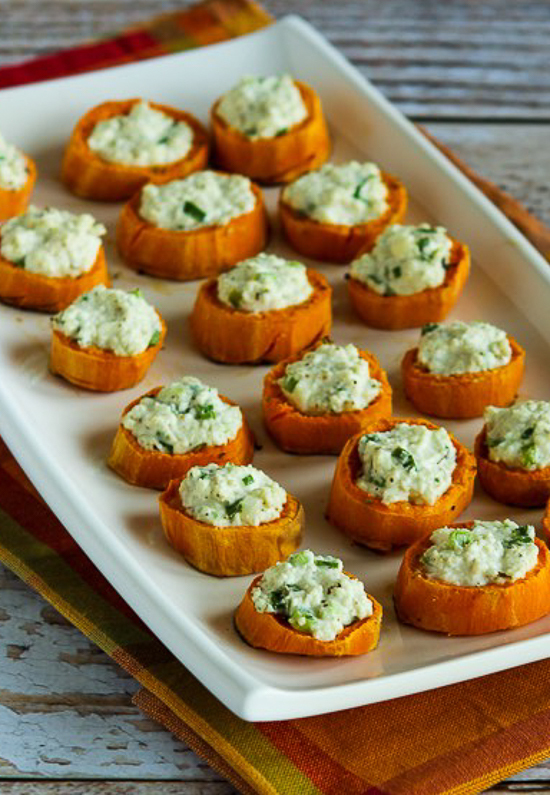 Sweet Potato Appetizer Bites with Feta and Green Onion! I’ve been a little distracted, and now it feels like I went to bed in November and when I woke up there were less than two weeks until Christmas! And I do have a few new holiday recipe ideas I want to share before things get too crazy, starting with these Sweet Potato Appetizer Bites with Feta and Green Onions. Yum! I love this combination of flavors, and if I went to a holiday gathering or Super Bowl party and found a table loaded with sweets and chips staring me in the face, I would be so excited to find a deliciously healthy option like this to eat instead. The hardest part of making these might be finding the thin sweet potatoes, but you can make them into two-bite nibbles if needed! Choose long, thin sweet potatoes and peel completely. 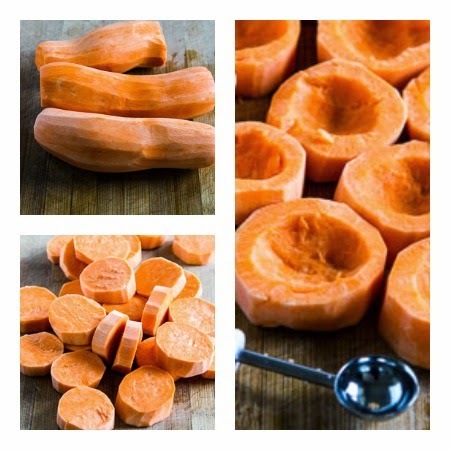 Cut sweet potatoes into 1/2 inch rounds, then use the small end of a Mellon Baller to scoop out a well in each piece. Spray a baking sheet with olive oil (I used my Misto Olive Oil Sprayer, but you can also brush on the oil.) Place the sweet potatoes on the baking sheet, spray with olive oil and sprinkle with a tiny bit of Italian Herb Blend. While the sweet potatoes bake, mash the feta with a fork and then mix in the Greek Yogurt, Greek Seasoning, and sliced green onion. Bake sweet potatoes until they’re as soft as you like them (about 25 minutes). Then fill each sweet potato with a little scoop of the feta mixture and bake about 5 minutes more. Serve hot and wait for people to rave about them! Yield: Makes about 24 appetizer bites. Choose long thin sweet potatoes if possible. Peel sweet potatoes and cut off the ends; then cut each sweet potato into 1/2 inch thick slices. Spray or brush a baking sheet with olive oil. Arrange sweet potatoes on the baking sheet with the scooped-out side up. Bake until sweet potatoes are cooked through and starting to get a little color on the edges, about 25 minutes. 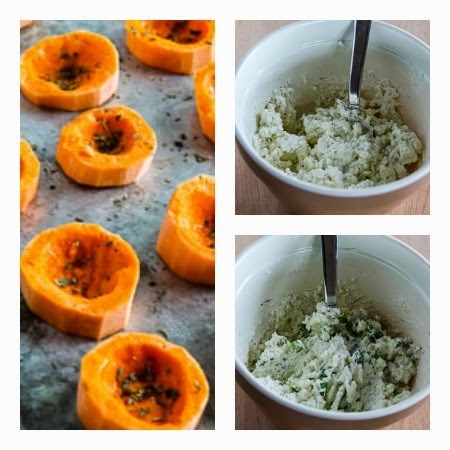 While sweet potatoes bake, put the crumbled Feta into a bowl and mash with a fork. Add the Greek yogurt and Greek seasoning and mash together with the Feta, then stir in the sliced green onions. When the sweet potatoes are done, remove from the oven and place the baking sheet on a trivet or hotpad; then use a small spoon to fill the well in each sweet potato slice with the Feta mixture. These will keep in the refrigerator (if you’re lucky enough to have any left!) and they’re amazingly good reheated the next day. I haven’t tried it yet, but to make ahead for a party I think you could cook sweet potatoes and fill them with the Feta mixture; then refrigerate the filled sweet potatoes and heat them right before you serve them. If you try that, I would let the filled sweet potatoes come to room temperature while the oven heats. I love Greek Seasoning for this recipe, but you can use any seasoning blend that goes with these flavors. Recipe adapted from an idea in The South Beach Diet Parties and Holidays Cookbook. This would make a great appetizer or snack for Phase 2 or 3 of the South Beach Diet or any type of low-glycemic eating plan. Sweet potatoes are a bit lower in carbs than regular white potatoes, but this is probably too high in carbs for a regular low-carb eating plan. Use the Special Diets Index page to find more recipes suitable for a specific eating plan. You can also Follow Kalyn’s Kitchen on Pinterest to see all the good recipes I’m sharing there. I made these for Thanksgiving yesterday and they were fantastic! I prepared the potatoes the day before and then did the final step right before serving. When I tasted a little bit of the filling I decided they would be good with a tiny drizzle of really good balsamic vinegar and boy was I right! Unfortunately there were no leftovers. Can’t wait to make them again. This is such a great way for a low carber like myself to enjoy the taste of sweet potatoes without over indulging. Thanks so much for the recipe. So glad you enjoyed it! I love the idea of preparing ahead and also the balsamic drizzle! I could make a meal out of these! In fact, I think I'll do just that! A perfect nibbler. I could make a meal out of these too. I'm thinking goat cheese would work instead of the feta as well. Thanks Lisa. I agree, goat cheese would be delicious! I'm Pinning these! Can't wait to try them! I like that you mixed a bit of yogurt with the feta so it's more like a spread instead of a sprinkle of feta. Thanks Letty, so glad you liked them. The Feta mixture was still pretty stiff but the yogurt helped keep it together. I would be happy to see these on a holiday table as well! In fact, I might have to be the one who brings them! Thanks Joanne, glad you like the idea. These will be perfect for Hogmanay nibbles Kalyn. I love them! Jacqueline, so glad, they were seriously good!